TIP is well connected politically. As of mid-2014, its Board of Advisors included approximately a dozen members from both the House of Representatives and the Senate. Advisers have include Reps. Joe Wilson (R-SC) and Eliot Engel (D-NY), and Sens. Mark Kirk (R-IL) and Robert Menendez (D-NJ), among others. Retired Sen. Joseph Lieberman (I-CT) and former Rep. Allen West (R-Fl) have also served on TIP’s Board of Advisors. Under Block's leadership, TIP has engaged directly in divisive partisan battles in Washington. In one instance, when Block derided future Secretary of Defense Chuck Hagel's “realist” views on Iran as "well outside the mainstream" during Hagel's confirmation battle, a former administration official familiar with TIP remarked that Block's confrontational style "calls into question what the role of TIP is, could be and should be." Among its suggestions, the 2009 study suggested framing the issue of the right of Palestinian refugees to return to their homes as “mass Palestinian immigration.” The logic behind this, Luntz explained, is that Americans are “afraid of mass immigration of anyone right now” and thus would be more inclined to side with Israel on this issue. TIP has been accused of frequently overstating purported threats to Israel. In 2013, for example, Josh Block announced that TIP opposed the Obama administration's nuclear diplomacy with Iran, warning that any agreement that allows Iran to peacefully enrich uranium on its own soil—a right under the nuclear Non-Proliferation Treaty (NPT)—would be an "unacceptable outcome." In an August 2012 “TIP Take Action Alert,” the group proposed a number of alarmist “talking points” for a message that TIP followers could send to U.S. leaders, including that ”Iran's leaders are defying U.N. resolutions and world opinion by continuing to develop nuclear weapons while issuing frequent threats to destroy Israel.” However, at the time of the action alert, U.S. intelligence agencies held that there was no evidence indicating that the country had begun work on a nuclear weapon. Geared towards mobilizing individuals to sign petitions to “help increase pressure on Iran and Washington,” the website implicitly critiques the Obama administration’s diplomatic strategy towards Iran. According to the site, a “good deal” with Iran is one that curtails Iran’s ability to develop its “ballistic missile program” and “dismantles” centrifuges in the country. Iran has never been required to dismantle all of its centrifuges—which it has the right to operate for power generation purposes—and the Obama administration has clearly stipulated that missiles are not the subject of ongoing negotiations. TIP has heavily criticized the Obama administration’s policy on Israel. During the 2009 settlements row between Israeli Prime Minister Benjamin Netanyahu and Obama administration officials, TIP claimed that efforts to freeze the construction of illegal Israeli settlements in the occupied Palestinian territories amounted to “a kind of ethnic cleansing to move all Jews” out of the West Bank. During the 2013-2014 Israeli-Palestinian peace talks led by U.S. Secretary of State John Kerry, Block said, “Jewish groups throughout the process should be urging sensitivity to Israeli security needs in a tumultuous neighborhood” and “should be prepared as well for the possibility of the talks failing due to Palestinian intransigence.”TIP launched a website called “Yes to Peace,” which stresses “Israel’s need for a security presence in the Jordan Valley.” The site has a detailed infographic advocating for an Israeli presence in the West Bank’s Jordan Valley and features a quote from UN Security Council resolution 242, saying Israel must have “safe and secure borders.”The website fails to mention that resolution 242 also requires Israel to end its occupation of the West Bank and establish its borders at the pre-1967 War boundary—a position accepted internationally, including by the United States. TIP's other core activities include funding public opinion polls on U.S. views of Israel and its neighbors and producing TV commercials promoting an Israel-centric view of the Middle East. In early 2004, for example, the group began running 30-second TV ads across the United States, which according to UPI featured "mothers of victims killed in suicide bombings" in an effort to build support for building the so-called security barrier between Israel and the West Bank. The polling methods used by the Israel Project have on many occasions received criticism from polling experts. In one such case in 2014, TIP claimed that a poll it had carried out found “broad, bipartisan support for increased sanctions” on Iran. However, pollster Dina Smeltz of the Chicago Council on Global Affairs said the poll was not neutral and that its results should not be considered credible. Smeltz noted that when asked directly and clearly about whether the United States should increase sanctions on Iran, a majority of Americans (52 percent) were against it. Only when TIP framed survey questions with language that was biased and clearly attempting to persuade respondents to “change their views one way or another” does support emerge for TIP’s hawkish agenda on Iran. Soon after it was founded, TIP quickly generated attention. In August 2004, for example, when Ambassador Arye Mekel, Israel's then newly appointed consul general in New York, made his first public appearance in the United States, it was at an event organized by TIP and held on a yacht at New York's Chelsea Piers. Reported the New York Sun: "The Israel Project, founded in 2002, is a newcomer to the already crowded field of American pro-Israel organizations. But it seems to be welcomed by the established groups: also in attendance at the event yesterday were the executive vice chairman of the Conference of Presidents of Major American Jewish Organizations, Malcolm Hoenlein, and the executive vice president of the Jewish Community Relations Council of New York, Michael Miller." More impressive was TIP's July 19, 2007 press conference held on Capitol Hill to publicize the "Iranian threat," at which a number of current and former congressional members and well-known neoconservative pundits spoke, including Frank Gaffney of the Center for Security Policy. According to TIP's website, among those speaking at the event were Rep. Brad Sherman (D-CA), Rep. (now Sen.) Mark Kirk (R-IL), Rep. Jon Porter (R-NV), and Rep. Eliot Engel (D-NY). Engel, who serves on TIP's board of advisers, told the audience: "This is our Munich. We need to stand up to Iran and tell them they cannot thumb their noses at world opinion." Many 2008 presidential candidates contributed statements to the press conference, including Sen. Joe Biden, (D-DE), Sen. Sam Brownback (R-KS), Sen. Hillary Clinton (D-NY), Sen. Chris Dodd (D-CT), former Sen. John Edwards, former Gov. Mike Huckabee, and Sen. Barack Obama (D-IL). In his statement, Obama said: "Allowing Iran, a radical theocracy that supports terrorism and openly threatens its neighbors, to acquire nuclear weapons is a risk we cannot take. All nations need to understand that, while Iran's most explicit and intolerable threats are aimed at Israel, its conduct threatens all of us." Although the organization is not represented by many of the usual neoconservative suspects who populate the boards of other like-minded organizations, TIP's website prominently promotes many hardline groups and personalities. Its website has promoted the work of the Meyrav Wurmser-founded Middle East Media Research Institute; Clifford May and Walid Phares of the Foundation for the Defense of Democracies; Gaffney and CSP; David Makovsky of the Washington Institute for Near East Policy; Ilan Berman; and Ken Timmerman of the Middle East Data Project. According to TIP’s 2012 Form 990, the group collected around $6 million in revenues – up from around $2.8 million the preceding year. TIP has counted on funding from controversial right-wing “pro-Israel” figures, like billionaire hedge fund investors Seth Klarman and Paul Singer. Klarman, owner of the Times of Israel, has been both a major funder of TIP and a member of its board of advisors. Between 2008 and 2011, he gave the group nearly $4 million. His Klarman Family Foundation has also supported a number of controversial Islamic groups, including the American Islamic Forum for Democracy founded by Zuhdi Jasser, a controversial promoter of surveillance of Muslim communities. Klarman is also a prominent funder of the American Islamic Congress, an organization that the George W. Bush administration helped start. Singer’s funding of TIP garnered attention in early 2015 after Argentina President Cristina Fernández de Kirchner highlighted how groups in the United States who have received donations from Singer have been among the more vocal proponents of the idea that Argentina has tried to cover up alleged Iranian terrorist attacks. Singer—whose practice of purchasing the debt of developing nations has earned him the moniker “vulture Singer”—has had a long-running dispute with Argentina over of its debt, which his hedge fund bought up after Argentina defaulted in 2001. Alberto Nisman was the chief investigator of the 1994 Buenos Aires bombing who was found dead in January 2015 on the night before he was scheduled to provide testimony about his charges against Argentina President Cristina Fernández de Kirchner. In 2006, Nisman accused Iran of being behind the 1994 bombing, a claim that many observers have argued is based on flimsy evidence. Shortly before his death, Nisman made the charge that the Kirchner government was trying conceal Iran’s role in the attack in order to secure favorable trade agreements with Iran. According to writer Eli Clifton, since Block took over TIP and funding from Singer increased, there “has since provided a steady stream of content critical of Kirchner’s government” from TIP. The Israel Project, “About TIP,” http://www.theisraelproject.org/what-is-tip/. Eli Clifton, “Following Paul Singer’s Money, Argentina, and Iran (Continued),” LobeLog, May 8, 2015, http://www.lobelog.com/following-paul-singers-money-argentina-and-iran-continued/. The Israel Project, “Projects,” http://www.theisraelproject.org/al-masdar/. The Israel Project, “Board of Advisors,” http://www.theisraelproject.org/tips-board-of-advisors/. Nathan Guttman, “Ex-AIPAC Flack to Head The Israel Project,” Forward, August 22, 2012, http://forward.com/articles/161458/ex-aipac-flack-to-head-the-israel-project/?p=all. Josh Block, "New Leader Josh Block Gives Makeover to The Israel Project," The Forward, April 5, 2013, http://forward.com/articles/173737/new-leader-josh-block-gives-makeover-to-the-israel/?p=all. Patrick Cockburn, “The Secret Report that helps Israel hide facts,” The Independent, July 27, 2014,http://www.independent.co.uk/voices/comment/israelgaza-conflict-the-secret-report-that-helps-israelis-to-hide-facts-9630765.html. Josh Gerstein, "Iran talks delay puts White House on defense," Politico, November 12, 2013, http://dyn.politico.com/printstory.cfm?uuid=C3DB39A1-19E3-427B-822B-DD98ABFBDFE3. The Israel Project, “TIP Action Alert: Iran - August 2012,”https://web.archive.org/web/20130126062205/http://www.theisraelproject.org/c.ewJXKcOUJlIaG/b.7713613/siteapps/advocacy/ActionItem.aspx?aid=518830. “No Bomb for Iran,” The Israel Project, 2014, http://nobombforiran.com/. The Israel Project, “Israeli Borders under Assault from Flotilla, Airtilla,” July 5, 2011,https://web.archive.org/web/20130126062408/http://www.theisraelproject.org/site/apps/nlnet/content2.aspx?c=hsJPK0PIJpH&b=689705&ct=10894189. Douglas M. Bloomfield, “Change the policy, or change the subject?,” New Jersey Jewish News, July 9, 2009,http://www.njjewishnews.com/njjn.com/070909/opedChangePolicy.html. “Jewish groups lay low as Kerry works on Israeli-Palestinian peace framework,” The Jerusalem Post, February 5, 2014, http://www.jpost.com/Jewish-World/Jewish-News/Jewish-groups-lay-low-as-Kerry-works-on-Israeli-Palestinian-peace-framework-340387. “Help The Israel Project Stand Up for Peace,” The Israel Project, 2014, http://www.yestopeace.com/. Spencer Ackerman, “Pro-Israel Lobby Group’s Iran Petition Features Lots of Questionable Names,” The Washington Independent, December 12, 2009,http://washingtonindependent.com/70642/hawkish-pro-israel-lobby-groups-iran-petition-features-lots-of-questionable-names. “The Hague: The New Israeli-Arab Battleground," UPI, February 18, 2004, http://www.upi.com/Business_News/Security-Industry/2004/02/18/The-Hague-The-new-Israeli-Arab-battleground/UPI-69491077143901/. Ben Armbruster, “How Hawks are Manipulating Polling on Iran,” ThinkProgress, January 31, 2014,http://thinkprogress.org/world/2014/01/31/3232791/israel-project-iran-poll-credible/. Ben Armbruster, “New Right-Wing Poll Misrepresents Americans’ Views on Iran Sanctions,” ThinkProgress, December 12, 2013,http://thinkprogress.org/security/2013/12/12/3053381/luntz-tip-poll-iran-sanctions/. em>New York Sun, August 27, 2004. Khody Akhavi, " Candidates Hop Aboard the Iran Sanctions Bus," Inter Press Service, July 23, 2007, http://ipsnews.net/news.asp?idnews=38632. Guidestar.org, Israel Project Profile, 2012 Form 990. http://www.guidestar.org/FinDocuments/2013/371/472/2013-371472882-0a121efe-9.pdf. Josh Nathan-Kazis, "The Softspoken Man Behind Times of Israel," Forward, February 29, 2012,http://forward.com/articles/152169/the-softspoken-man-behind-times-of-israel/?p=all. Greg Palast, “Uber-Vultures: The Billionaires Who Would Pick Our President,” Truthout, October 6, 2011, http://www.truth-out.org/news/item/3772:ubervultures-the-billionaires-who-would-pick-our-president. Jim Lobe and Charles Davis, “Following the Money: The New Anti-Semitism?” LobeLog, May 1, 2015, http://www.lobelog.com/following-the-money-the-new-anti-semitism/. Editorial Board, “Argentina’s president resorts to anti-Semitic conspiracy theories,” The Washington Post, April 23, 2015,http://www.washingtonpost.com/opinions/conspiracy-theory/2015/04/23/0d2d07ca-e90b-11e4-aae1-d642717d8afa_story.html. 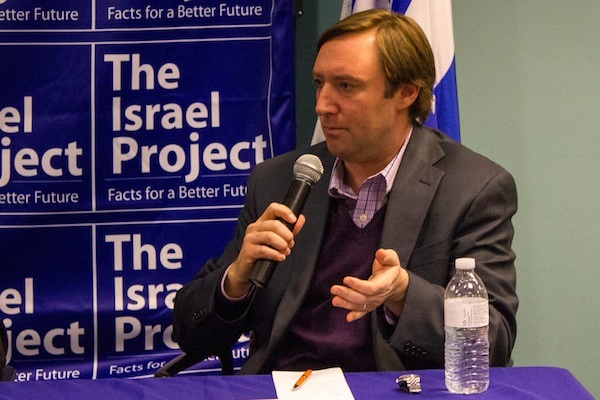 "Founded in 2003, The Israel Project (TIP) is a non-partisan American educational organization dedicated to informing the media and public conversation about Israel and the Middle East. A one-stop source for detailed and accurate information, TIP provides facts to press, policy makers and the public on issues affecting Israel and the Middle East, the Jewish people and America’s interests in the Middle East."